"Hello from Powell River, British Columbia, Canada. 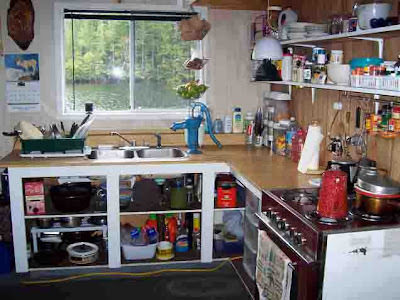 I live in a float cabin about twenty minutes by boat up Powell Lake. We bought it in 2001 as a summer cottage, but now that my husband and I are retired, we spend about 75% of the year living here. We love the remote lifestyle. We have propane for the stove, refrigerator and lights. We also have solar and wind power for some electric lights and to charge devices such as our satellite radio, computers and cell phones. We have chosen not to have television or the Internet. We check in with those things when we go to town for supplies, mail and other city chores. In the first picture you can see my cabin. It is anchored in place with steel cables and a log called a stiff leg. In the foreground is my floating garden. I grow tomatoes, squash, potatoes, peppers, lettuce, beets, onions, asparagus, strawberries and herbs. We don't have much space, but pack a lot in. In the background is our floating woodshed. Our woodstove keeps us toasty warm all winter. Stairs lead to shore and our outhouse. Here's my kitchen. I get water directly from the lake below with a hand pump. As you can imagine, we are extremely careful with greywater. What goes down could come back up. We boil the water before using just to be safe. The cabin is 20X21 feet with a sleeping loft. The kitchen is at one side of the downstairs great room. One thing I like about my kitchen is that it's so handy. I have everything I need, but nothing extra. Thanks to blogs like Rhonda's, I've learned a lot about becoming self reliant. You see, I'm a transplanted city girl from Los Angeles, California. Last year I tried canning and making jam for the first time. I've also learned to make bread using my own sourdough starter. It's been great fun and I know i'm going to enjoy it for many more years to come. Thanks for visiting my little kitchen up the lake. You can read more about my kitchen, cabin and off-the-grid living at my blog http://PowellRiverBooks.blogspot.com." A floating garden - I have never hear of that before. Amazing!! That is just the neatest place. Not sure I"m up for living there, but visits for a few weeks at a time would be wonderful! I lived in LA, CA for 6 years, and was so happy to move to central Texas. I have a yard, and lots of space and life is lived so much slower here (maybe because its so hot!). This house is just way too cool...and what a gorgeous setting to live in. I am so jealous. Wow, what a beautiful way to live. The scenery is just gorgeous and i love the floating garden. I have to say i have honestly never seen such a thing before, how ingenious. What you give up in conveniences you make back 10 fold in being able to wake up each and every morning in such a wonderful place. I admire and envy you. Thanks for sharing your special place. Wow, that is an amazing place to live! Wow what a unique way of living! I especially love the little floating garden! This could make a great selling lifestyle book! All I can say is WOW!! I want it! Wow, this is great. I love the floating garden too. What a neat idea. And I LOVE the BC coast!!! I lived in the Vancouver area for a few years and miss the beautiful mountains and the mild weather. I live on the Alberta prairies now, which are beautiful in a different way. Your home is just amazing!!! A floating garden and woodshed, Oh gosh I am just so jealous. Wow thats amazing, what a great place/way to live. wow. That's about all I can manage to say right now! What a fabulous life you lead Margy, thank you so much for sharing! What a gorgeous spot. How tranquil it must be! Thanks for sharing! Yep, I could move in with you! An idyllic lifestyle rich in comforts of the important kind. Lovely home, Jen. How wonderful! You have started off this new series with a bang! Oh My Goodness. That is so cool! Whoa!!! What an amazing post! Wow - what can I say - your little patch of paradise. I'm really jealous! Oh how funny to see Margy here. I also live in Powell River and it was through her blog that my husband and I purchased our very own float cabin. This is truly a wonderful place to live and we hope to live on our float cabin for most of the year when we are done with work...I love the idea of a floating garden but I will also need some space for our chickens..maybe on the shore behind our cabin??? Your floating gardens remind me of those I have seen in Indonesia, where the locals create floating rafts for vegetable crops when land space is short. We live on 9 acres in Clarendon, South Australia, and our challenge is just the opposite to yours; lots of space for growing vegies but little water! That is the coolest set up I have ever seen! The floating garden is especially clever; no animals can eat the produce. Wow-that sure is a beautiful place to live. floating gardens---never heard of such a thing--really cool! Thanks for sharing! Wow you are not describing a house you must be in heaven! 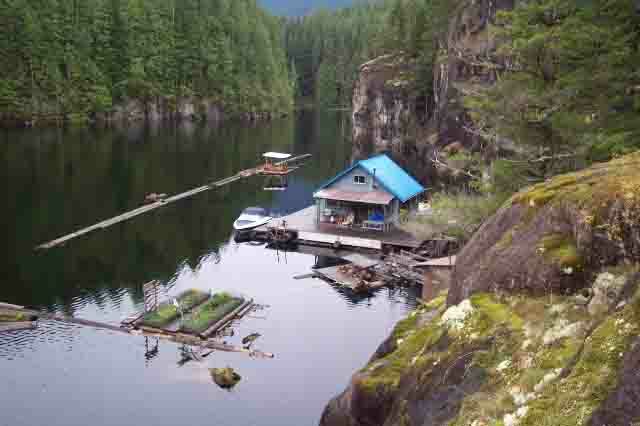 I am blown away, I have never heard of a floating homestead! How fantastically different from any living/working spaces I've seen before! Everything floats - that's so neat, but it makes me wonder about storms? What an idyllic setting, must be really peaceful. Oh, my. I don't think I have ever seen a more stunning location for a cabin. Just beautiful, beautiful, beautiful! Wow - I would love to be in your shoes right now - my husband and I are working our way there - he is semi-retired. We live in Northern Ontario Canada and think it's lovely here, but can't match your little cabin "on the lake". This is just the most beautiful place. It looks so peaceful. thank you for sharing. What an amazing place to live. It must be so pretty all year round with the view changing with the seasons. I love the floating garden and wood shed. Lucky you, Margy, for living a wonderful, simple life. You sound very content. What an amazing, resilient awesome woman you are.. I love your home and what your achieving there.. can't wait to get over and check out the blog. This is SO cool! I would love to live like that! That is a beautiful place to live, what a view. Love the floating garden. A facinating life you live. Margy, thanks so much for sharing your beautiful piece of paradise. How lovely it must be for you to wake each morning and live and work in your space there. Such a lovely home! This is neat to see as I lived in powell river for my first few years as a child. Now I live on the mainland but still close to the coast! Very very inspirational and creative to have set up home there It looks wonderful. My husband is Dutch and quite a few people there live in boat houses but nothing with quite the spectacular scenery as you have. it is simply stunning and I would love to be that remote away from the madding crowds. Good for you for living the dream. This is very cool I love it! so lush and green. and the view from your kitchen sink would make anyone happy to wash the dishes. WOW! I bet the wildlife is neat to see there. Super pretty. Neat garden! No LA car noises around your place. Nice! This is an amazing way of life. I would love to own something like this. I love the gardens. Congratulations on becoming so self efficient. You live is a beautiful part of this world. It so reminded me of Harrowsmith magazine in the '70's and '80's, where BC was the place to spread your roots and be different. Glad to see this can still be accomplish. Job well done and thanks for sharing. Spectacular is right! What a killer view. You are surrounded by the peace & serenity of the river. Lovely - thank you for sharing. It is certainly different and unexpected! What a creative spirit you have and look how successful your venture has been. What an amazing place to live - and thank you for sharing it with us. Never seen anything like it before, and the scenery is so beautiful too. Wow, I know years ago my mom and dad lived in a floating town on Vancouver Island. So I have heard about floating gardens etc. Living off the grid might be okay, but I kinda like my comforts. Beautiful scenery surrounding her though. WOW. Floating everything, and it is all breathtaking! What a place! thank you for sharing, Margy! Wow, too cool. Thanks for sharing! I just got back to town from the cabin and what a surprise. Thank you Rhonda for letting me be the first in your new series. Lots of your readers have come to visit my blog as well and that's been great. And thank you readers for all your comments. It's a different kind of lifestyle, but a very rewarding one. aha! I follow your blog and Margaret's too as I have a young friend teaching in Powell River so it was a treat to see you here today. Come and join our forum too if you have a little time to spare and meet many more plp enjoying a simple life all over the world. WOW!!!! What a dreamy place to live!! Love it! When can I visit? LOL! oh wow I want to live there! OMG!!!! This is absolutely fantastic. What an incredibly beautiful setting!!! A floating garden? I never heard of such a thing - how ingenious! You are living a dream of many. I can't even imagine what the wildlife must be like. You are really something! I can't wait to go to your blog, and read about your life. I'm sure it will go to my favorites. Best of luck to you - you awesome lady. Wow. Now *that's* the good life. I'm just floored, and inspired, by this and all of those who have shared their kitchens and their spaces. This is being printed out and going up on my fridge!